Lo, those years ago prekids Melanie & I took a memorable October trip. Flew into Montreal. Enjoyed the old world feel even with the we're French go home vibe. Spent time with church planter friends in Burlington, Vermont. Had the single most amazing, utterly gorgeous, day long drive of our lives across upstate New York. Crossed Lake Champlain by ferry through the early morning fog like a century's past military expedition. Drove the winding roads autumn ablaze in yellows, oranges, reds & greens. Through picture postcard towns like Lake Placid, Saranac Lake, Cranberry Lake, & Star Lake. A lakey place Upstate is. Day's end found us in Niagara Falls, New York at a bed & breakfast that was not quite so picture postcard. The folks running it, well... hospitality was not their gift. We asked, & received with a why are you troubling us look, directions to a local eatery. Enjoyed the food. Set out to find coffee & dessert in Niagara Falls, New York. Really? Why? Folks were puzzled we'd asked. Writing us off. Tourists. "Let's go over to Canada & see what they've got. It's right there." And, think then, we'd be all expeditionary again. Crossing international borders at will. And for what? Coffee & dessert & because we can. "Ever been to Tim Horton's?," asks the Canadian border dude. Directions given. Few blocks. One turn. Few more blocks. Tim's. Good coffee. Donuts. Of course. Rambling conversation with a half-crazed Canadian. Didn't know he was dealing with a half-crazed Texan & his fully-sane Louisianan missus. Sated. Back into the US. Mission accomplished. "Your purpose for going to Canada?," US border guy dude. I smiled & held up my cup-o-Tim's. "You went all the way to Canada for a cup of coffee?," he queries. "Yes. Yes we did." We're expeditionary, cosmopolitan adventurers that way, you know. How far did God go to redeem us? 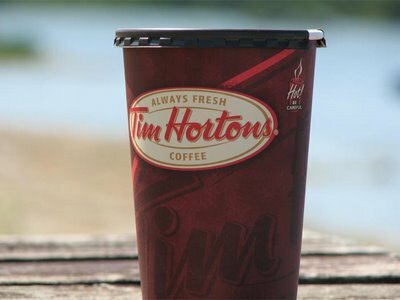 We went to Canada for a cup-o-Tim's. Jesus left Heaven for all us Joes.